According to Greek Mythology, the Aegean Sea owes its name to the King of Athens, Aigeas (Aegeas). 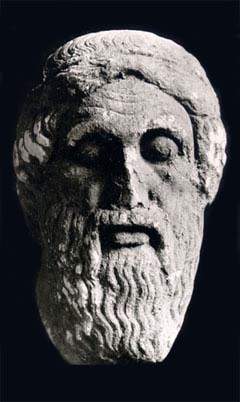 King Minos 'Minoas' of Crete in order to punish the Athenians who had killed his son Androgeo, declared war on Athens and won. The Athenians subsequently became subjects of the Minoan Empire. King Minos then demanded that a tribute of honour be paid. At nine year intervals, seven Athenian boys and seven Athenian girls were to be sacrificed. They were to be sent to Crete and devoured by the mythical Minotaur, a monster with the body of a man and the head of a bull, who lived in the Labyrinth. 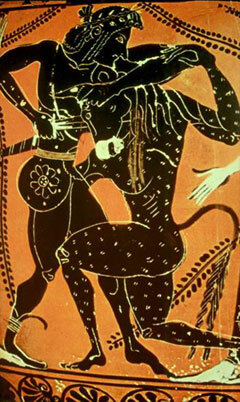 Thiseas, the son of Aigeas and Aithra, decided that he would slaughter the Minotaur and end the shameful bloody sacrifices. He took the place of one of the seven young men and set sail for Crete. Before he left, it was agreed with his father Aigeas that they would hoist black sails as a 'show' of mourning, but that if they were successful and slayed the monster, they would hoist white sails on the journey home. On his journey he met and fell in love with Ariadne, daughter of King Minoas. She gave him a ball of string, 'Ariadne's Clue'. The idea was to unravel the string in the Labyrinth, so that after Thiseas slayed the Minotaur, he would find his way back to the entrance. The mission was successful and the Minotaur was killed. Under the cloak of night, Thiseas, Ariadne and the others escaped to the port and embarked on the ship for the return journey. On the way they stopped at the island of Naxos. Story tells us that Thiseas abandoned Ariadne while she was sleeping and continued on his journey home, but forgot to raise the white sails as he had promised to Aigeas (some say that Ariadne laid a curse on Thiseas). Aigias waited for his son to return. As he stood on the Akrotiri of Sounio, he spied the ship as it rounded the cape - it had black sails. Believing that his son was dead, the king despaired. He jumped off the cliffs into the sea from the temple of Poseidon and killed himself. There are differing opinions about the Aegean sea and how it got its name. According to Professor Christos Doumas, head of the archaeological excavations at Akrotiri, the name Aegean has its origin in the Homeric verb ‘aisso’ which means 'to jump'. The derivative noun from this verb is ‘aix’ = the goat, in other words an animal that jumps. In ancient times the Greeks called large waves ‘aig(y)es’ (as jumping goats). Thus we arrive at “Aegeon” = Aegean. In modern day Greek it is called 'Aig(y)aio'.